Homes & Antiques is a must-have magazine subscription for followers of great design and fascinating objects from a period in time. 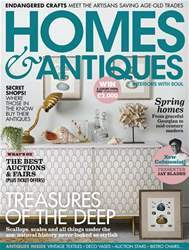 Every issue includes a range of antiques and collectables guides to help you discover your home style. Homes & Antiques highlights a range of interior, exterior, design and decorating ideas to keep you inspired all year round. Look forward to buying advice, features on legendary design icons and everything from heritage and architecture to vintage fashion. Join the thousands of global readers with a monthly Homes & Antiques digital magazine subscription today - the best homes and antiques magazine. Subscribe today! 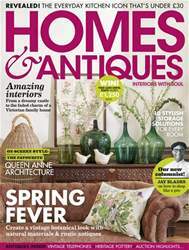 Looking for Homes & Antiques Magazine in print? Unfortunately pocketmags.com does not sell print copies of Homes & Antiques Magazine, but all is not lost. Our partner at magazine.co.uk sells print subscriptions at the best prices online. For the last 25 years, Homes & Antiques magazine has held a loyal following of readers by remaining committed to helping you display your antiques in your home in the best way possible. 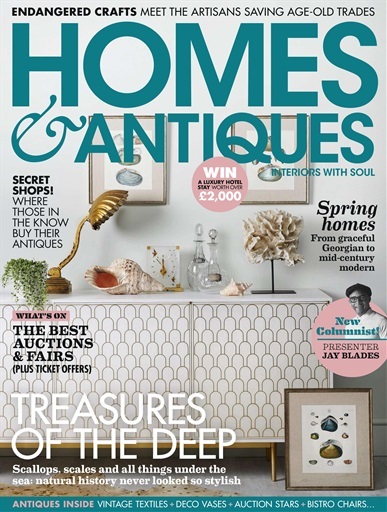 Homes & Antiques is cherished for its combination of ideas and advice and is packed full of fascinating stories on antique sourcing and buying. Homes & Antiques magazine covers design styles from across the world, whether it’s individual pieces or residence wide level, spanning all rooms, styles and designers. Discover the top 10 ways to display your artwork throughout your home, whether you want an on trend gallery wall, a bold and dramatic mural or even simply leaning pieces of art against a wall to prevent from any damages. There are ideas to suit all styles and tastes. Whether you’re passionate about upholstery, furniture, flooring, art or antiques, you’ll find all the best information from the biggest names in your monthly digital magazine of Homes & Antiques - download the latest magazine to your device and enjoy immediately today! 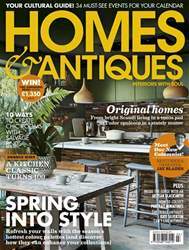 You'll receive 12 issues during a 1 year Homes & Antiques Magazine magazine subscription. You'll receive 12 issues during a 1 year Homes & Antiques Magazine magazine print subscription.